Welcome to Graduate Student Stories, where we get the chance to showcase some of our amazing graduate students who are deeply committed to their research programs, and give them a chance to reflect on their work and their participation in UBC’s Anthropology Graduate Program. Meet Michelle Hak Hepburn, the first student showcased in our Graduate Student Stories series! 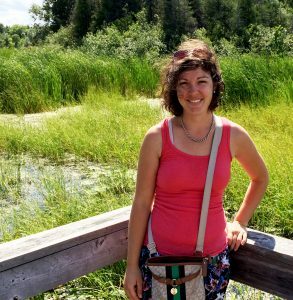 Michelle, a current Master’s student continuing on her PhD in September with a focus on socio-cultural anthropology, was born and raised in the Ottawa area. Michelle opted to stay in Ottawa to double major in Linguistics and Anthropology as an undergraduate, and has since travelled to and lived in different countries. Having worked in Peru, Michelle decided to return to Canada to enroll in an MA program. When she needs a break from her academic work, you can find Michelle playing soccer in the Metro Vancouver Women’s League or making crafts. Why did you choose to pursue Anthropology as a career? I was always interested in Anthropology – I had a great social studies teacher in high school – but I didn’t decide to study anthropology right away. I took time off after high school and it was then that I realized that anthropology’s holistic approach would allow me to study everything that I was interested in. Anthropology creates space for multiple perspectives; at the time I felt that research in a laboratory – while important – was too limiting for the questions I wanted to focus on. Why did you choose UBC’s Anthropology graduate studies program? When I was looking to do my MA, I wanted to attend one of the top schools in Canada. I also wanted to do a research-based MA, not a course-based one. One of the biggest factors for me, though, in deciding on UBC was that my supervisor responded quickly and positively to my research topic before I applied. This showed me that she was willing to make time for me and had interest in my project, which was really important to me. Personally, I also wanted to be close to family (especially my sister) as I have a lot family members living in Vancouver. Within socio-cultural anthropology, I focus on the environment. I’m particularly interested in how people categorize different forms of “nature” and how they interact and relate with the world around them. What do you enjoy and what do you find challenging as a UBC Anthropology graduate student? I love walking through the Rose Garden on my way to the Anthropology building, and taking a moment to appreciate the view of the mountains across the ocean on a clear day. But what I really enjoy most are the people I’ve met here. Graduate school is a challenging endeavor. It requires a lot of hard work, and you need to stay focused. Imposter syndrome is a real thing. These are not unique challenges to UBC, but they need to be acknowledged. Are you involved in any anthropology-related extracurricular activities or leadership roles? Heather Robertson and I are the AGSA (Anthropology Graduate Student Association) Co-Presidents for the 2016-2017 academic year. Being involved with the AGSA (even just by attending the meetings!) is a great way to connect with your fellow graduate students. Taking on a larger role (being a council rep, for example) is also great to add to your CV (something to think about)! What are the most valuable things you have learned and do you have any anthropology-related accomplishments you’re proud of? Wisdom comes from the unlikeliest of places. And balance is important – life is not all about work. But speaking of work and anthropology, I’m proud of what I’ve achieved so far. I’ve been lucky enough to be able to work as an applied anthropologist at a research institute in the Peruvian Amazon. Formally a volunteer position, it was a job that I was able to create for myself through personal connections and through a Canadian NGO. What advice would you give to someone interested in pursuing graduate studies in Anthropology? Know what you’re interested in, and talk to people about what you want to do! Don’t be shy. Talk to your professors, your teaching assistants… it helps you define what it is exactly that you’re passionate about. But don’t be discouraged if you don’t have an extremely specific research question. Such questions can evolve through your studies as you learn more about a topic. Also, get started early! Every school has a different admissions process, but it’s always a good idea to contact faculty you would like to work with well in advance of the application deadline and before you apply.